Our lake home is located on a serene, clear, quiet lake ten miles east of Hayward, WI. The place is perfect for a "get away" to enjoy the many winter recreational activities, enjoy the beauty of the fall season, and/or summer fun at the lake. You may also want to enjoy the solitude and beauty of Northern Comfort in the fall -- fishing continues to be great, the ambiance is awesome and plenty of local trails are available for walking and/or biking while enjoying the beauty of the autumn colors. Winter is a special time too -- a time to try some ice fishing and/or hit the trails for snow shoeing or skiing, and/or just snuggle up with a book and enjoy the serenity of Northern Comfort. We are less then 10 miles from Hayward which is an awesome town for family fun. The area is great for all types of spring, summer, fall and winter recreational activities. We just recently purchased this lake home for rental purposes. Our current home is next door. We fell in love with the lake and all that the Hayward area has to offer so when this place was available to purchase we wanted to share the joy and relaxation we enjoy at Lovejoy with others. The upper level of this home consists of two bedrooms, a master bath and a main bathroom. A nice size open space includes a family room, dining area, and a kitchen supplied with all the necessary cookware and utensils needed to make a great meal. A plus is that we have chickens and if our chickens are laying we love to share eggs! Also on the upper level is a spacious screened porch that looks out onto Lovejoy Lake. The lower level consists of a non conforming bedroom, a workroom, laundry facilities, a bathroom and another family room. When we purchased this home there were many shelves in the lower level family room so being an avid reader, rather then donating the books I had purchased and read, they are now becoming a small library for your reading pleasure. Also being shelved are many DVD's for rainy day entertainment! Hayward is a great city for family activities. There are also many great golf courses and dining options. We are only a few miles from the Birkie Trails and the Chequamegon National Forest. We are strictly enforcing no pets and a no smoking policy. My husband Mike and I are retired educators. We both taught and were administrators in the twin cities area. Ten years ago, shortly after our first granddaughter was born, we searched and found our perfect lake home. Every weekend and days off work that we could get away, we would spend here! After we both retired, we held on to our home in the White Bear Lake, Mn area for a short time then in 2015 we sold that house and became full time residents of Hayward, Wi. In November of 2016 we were able to purchase the lake home next to ours -- thus the creation of Northern Comfort and our ability to share with others the serenity, beauty and ambiance of Lovejoy Lake and the surrounding area! We chose to purchase on Lovejoy Lake because it is small, has not public access, the water is clear, and the fishing is great. We especially enjoy the quietness of this area because of no public access; therefore it is only lake residents and renters that are on the lake. A gentlemen's agreement among owners includes a "no wake" policy which makes all the lake activities more enjoyable. During the winter, if possible, some of us create a ski trail around the lake. 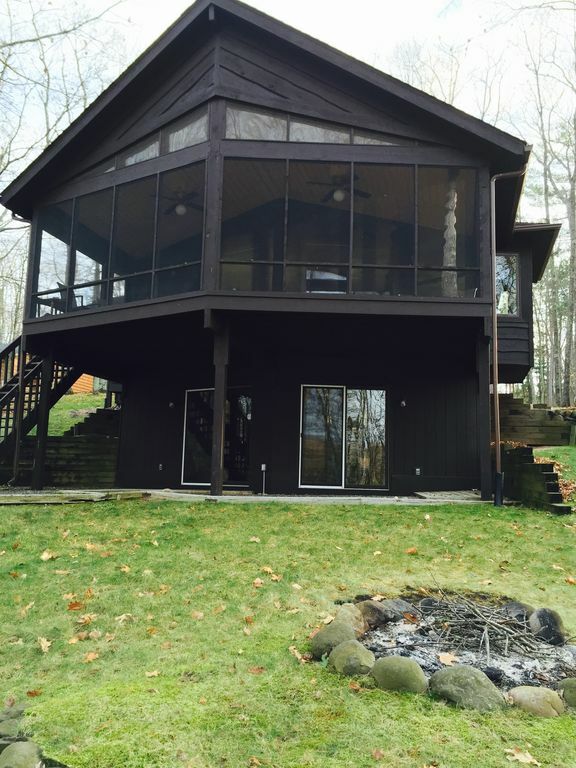 A special benefit of Northern Comfort is the screened in porch that overlooks Lovejoy Lake! Our guests have enjoyed many hours reading, playing cards, eating, listening to the loons, enjoying the antics of our free range chickens and/or simply enjoying the beauty and serenity of the setting. There is a long driveway and a turnaround in front of the garage that includes ample parking area. The upstairs living room includes a large sofa and several other pieces of furniture for comfortable seating. basic pantry items are provided. Full kitchen including dishes, cook and bake ware, utensils and everything you would need to prepare and serve meals. A large variety of fiction and non fiction books are located in the lower family room. If we are aware of young children as guests we will have a variety of children's books available. A fishing boat with an electric motor is available. A highlight of this property is the screened in porch. Patio area is available below the screened in porch. The place is very roomy and welcoming. Charming rooms upstairs and a large family room downstairs. The hosts live next door and were very welcoming. We enjoyed the layout of the house with an open concept living room, kitchen and dining area. The view of the lake is beautiful from both the upstairs and downstairs multiple windows and patio doors. The home is clean and cozy. There was plenty of room to gather together. We will definitely return. The lake was beautiful, the cabin was great, and the owners delightful. We were also very entertained by the chickens! The only problem was that we were too busy with activities scheduled elsewhere to have enough time enjoying the lake. We all want to come back! We had a great time, hope to stay again in the near future. Thank you so much for making our trip enjoyable. We had a short mini vacation and the cabin was wonderful. Loved listening to the lions in the large screened on porch. Beautiful view of the lake. Owners live very close. Right next door. We liked having you as guests - I'm assuming it was loons you enjoyed listening to rather then lions! Our cabin was clean, comfortable and had all the amenities we needed. We loved the screened in porch where we sat out on a lot even when it sprinkled. The fire ring was great, enough chairs for all 6 of us. The scenery was breathtaking. Very quiet. Mary and Mike are fantastic hosts. Responded to questions in a timely manner. They were very friendly and informative. Would come back!!! !